When bubbly Gale Storm got that eye-crinkling demeanor, look out, she’s up to something, usually more trouble for old dad, Charles Farrell. 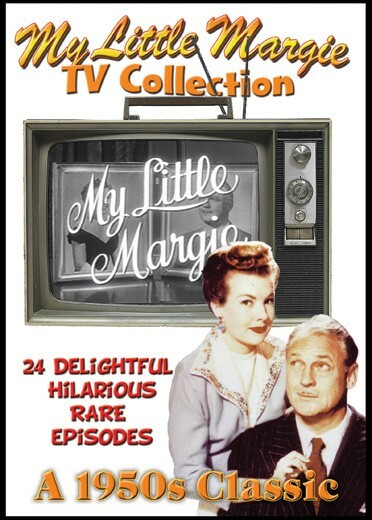 My Little Margie had a four year run on TV beginning in 1952. Gale Storm and Charles Farrell played father and daughter, Vern and Margie Albright in this very funny comedy series. My Little Margie premiered on CBS as the summer replacement for I Love Lucy on June 16, 1952, under the sponsorship of Philip Morris cigarettes. Its success prompted NBC, at the sponsor’s request, to give it a regular berth – Saturday at 7:30 pm – on its fall schedule, where it lasted for two months. In January 1953, it returned to CBS [Thursdays, 10pm], where it remained until July. Two months later, it was back on NBC (for new sponsor Scott Paper Company) on Wednesday nights at 8:30, where its final broadcast was on August 24, 1955. The Missing Link, Hillbilly Margie, Trapped Freddy, Buried Treasure, To Health With Yoga, A Horse For Vern, Vern’s New Girlfriend, Delinquent Margie, Margie’s Phantom Lover, What’s Cooking?, Margie’s Millionth Member, Meet Mr. Murphy, Margie Babysits, Honeyboy Honeywell, Margie And The Shah, Star Of Khyber, “Vern’s Winter Vacation, San Francisco Story, Miss Whoosis, Unexpected Guest, “Vern’s Mother-In-Law, Hawaii Story, Corpus Delecti, Papa Mambo.